Soliflores can be tricky propositions, especially for those of us with short attention spans. Either too linear or too literal, too fleeting – or too much. If like me you have a penchant for certain odiferous blooms – in my case, lilies, roses, lilacs, wisteria, carnations, orange blossom to name but a few, it stands to reason that some days, you simply want to take that joy with you, hopefully without being bored halfway through the day. Not so long ago, I went on an Oscar – as in Wilde – binge, and naturally enough, carnations popped up. But have you noticed something? Those rarified, ostentatious hothouse blooms have lost their scent these days. Even those glorious dark red carnations – surely a visual statement of no small order – don’t have much more than a fleeting, peppery note, nothing like the rich and heady flowers of Oscar’s day. Failing the Real Thing, I next went on a mission to locate The Ultimate Bottled Carnation. Sadly, Floris’ ‘Malmaison’ has been discontinued, and good luck finding any – you’ll need it. Next up, I found Comme des Garçons Red Series 2 ‘Carnation’ – and thank you, Dimitri, for telling me where to locate it in my remote perfume desert. I spent an afternoon with it, and I’m telling you, if any perfume should be titled ‘Red’, or more likely, ‘Red Hot’, this is it. Wheee! Pepper and clove and Cinnamon with a capital C, this stuff puts the ‘carnal’ in carnation. Carnal or venal, I’m not sure which, but not for me. It nosedived into the pepper pot on my skin in a way I probably wasn’t sophisticated enough to appreciate, or maybe it was a question of time. The bottom line was…no. I tried to locate Etro’s ‘Dianthus’, and just like with ‘Malmaison’, had rotten, lousy luck. It has also been discontinued. Nina Ricci’s ‘L’Air du Temps’ – a classic for a reason – was another perfume that highlights carnation, and again – not for me. Almost anything my mother wore is by default out of the running. It just felt…wrong, like a four-year-old getting into Mommy’s lipstick and stilettos. I just wasn’t…woman enough! 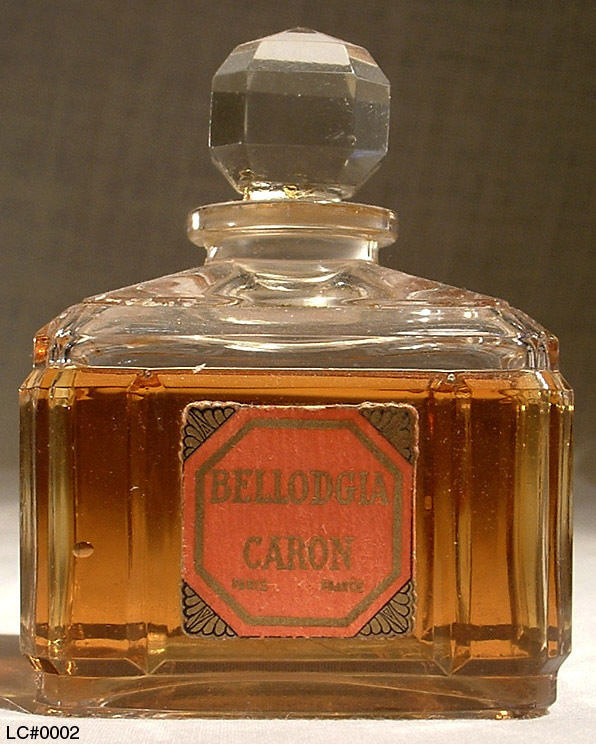 Which was when I found Caron’s ‘Bellodgia’. Created in 1927 by Ernest Daltroff, it is considered one of the world’s finest carnations, created to evoke the town of Bellagio by Lake Como, ‘carnations soaked in sunshine’. I took a deep breath, crossed my eyes and toes and wished for a birthday bottle of the eau de parfum. Reading about a perfume and trying to evoke it in your olfactory imagination only gets you so far. It is…perfume by proxy, and nothing can quite prepare you for The Real Deal. Which explains the Try Before You Buy ethos of perfumoholics like myself, unless, also like me, you like surprises! Therefore, it was with some trepidation I opened that birthday package, crossed my fingers and – sprayed. Yowza! What was that slightly…weird thing going on, that thing that said…PERFUME, BABY! The old-fashioned kind, the kind they don’t make like this any more, but right before I was ready to swallow my disappointment…it was National Carnation Day chez Maison Tarleisio, and the most opulent, heady, dizzying, erm, incarnation of well, pinks – of carnation and clove and thick, sweet vanilla, underscored by what to my nose smelled like rose, but according to the notes is actually lily-of-the-valley and jasmine – bloomed and radiated and emanated in all directions. This was the carnation to slay all carnations, this was stupendously beautiful and viciously addictive. This carnation was a loyal soul – it never strayed and stuck like duct tape to my perfume-eating skin, finally drying down to a soft, powdery, mossy vanilla-clove-musk finish that on me reminds me of sandalwood, but sweeter, with a vanilla edge that is not at all gourmand but definitely edible. So good, I nearly wanted to eat my arm, or sub-contract the job to someone else who would. Nothing funereal about it in the slightest, but very much a living, breathing, emanating joy. I’ve worn this at the height of summer, and I’ve worn this on icy, windy, snowy days and it behaves differently according to the weather. Heat amps up the floral notes, but on cold days, this is snuggly, vicuña comfort in a bottle. My five-year-old adores it. When I wear it, he can’t get close enough, so long as it’s on my lap and he can bury his nose in my neck. He likes most things I wear, but of them all, Bellodgia is his favorite. Eau de Maman, if you ask him. That is all, and for a five-year-old, that’s enough. I haven’t had the opportunity to try this in parfum – vintage or reformulated – so I’m not in any position to say how much it’s been altered/ruined by reformulation. I’ve also read that in the newer eau de parfum, there is a green tea note, but I don’t get that at all. What I do get is a soliflore that holds my attention throughout the day, that is much admired by my surroundings for being in an entirely alternate universe from the usual perfumes of today, and that I have grown to love far more than I ever expected. 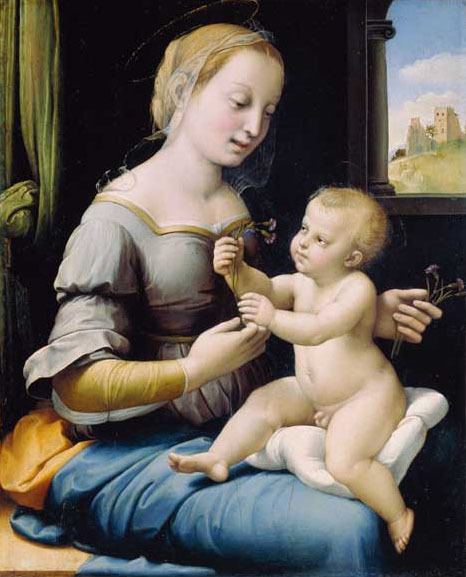 If Bellodgia were a painting, it would be the Raphael-attributed ‘Madonna of the Pinks’, for being so true to the scent of pinks, with their spicy, fiery heart, and if it were a Tarot Card, it would be the Major Arcana card called The Empress – the essence of motherly womanhood, caring, compassionate, comforting. As it is, it’s what carnations are supposed to be, but sadly, no longer are. It is also what perfumes should be, and all too often, rarely are. Posted on December 11, 2010 October 29, 2011 by Tarleisio	This entry was posted in Uncategorized and tagged Bellodgia, Carnation, Caron, CdG Red Series Carnation, Etro Dianthus, Floris Malmaison, Pinks, Soliflores. Bookmark the permalink. Well that sounds divine. I think carnation is an unappreciated note, at least lately. It's just the tihng to counter all the overly sweet stuff going around. I'll give this one a try, thanks! After such an emphatic and beautifully written endorsement, I can't but want to try this 😉 Caron is popping up on my radar left and right lately, time to sniff into the line, so to speak. I have had a few Carons in my life (there will be more reviews to come! ), and frankly, I'm slightly jealous of all the new discoveries you have in store! Thank you for the great recommendation! And thank you as well, for your recommendation of my review on your blog! I had a review planned for today, but have been feeling very much under the (frigid, snowy) weather. By now, things are looking up, and there will be another post, and another – one on a definite Caron duchess! – very soon! Stay warm and enjoy the gold-liquid happiness that is Bellodgia – vicuna in a bottle!